Tickets for the 18th Night of 100 Elvises are now available at Atomic Books! $55 each. Cash or check only. batgirl, originally uploaded by sugarfreak. This Sunday is Hampden's annual Halloweenfest on the Avenue. Bring your kids for trick or treating at participating shops and then hang out on the 800 block for the costume contests! We'll have free comics for kids! 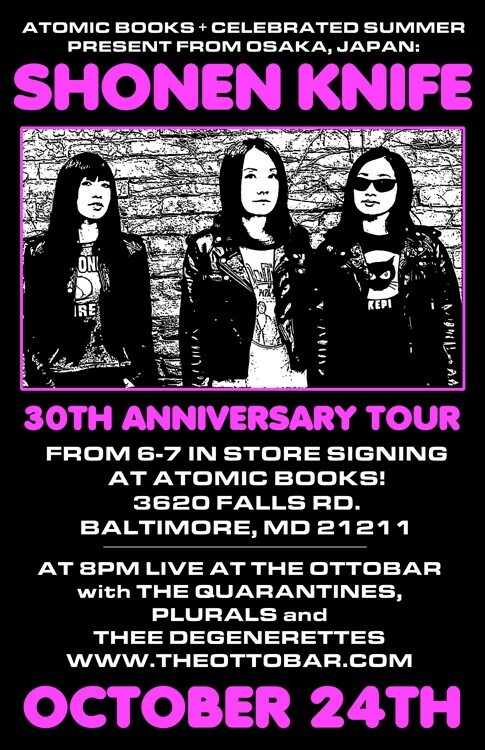 Shonen Knife will be at Atomic Books from 6-7pm on Monday! Come by and get cds and books signed and say hi before they play at the Ottobar! Celebrated Summer is going to have donuts! Tesco Vee and Dave Stimson will be at Atomic Books tonight to talk about their legendary punk zine Touch and Go. Starts at 7pm! Adult beverages will be served. Join local publishers Pinchback Press in celebrating the release of their newest anthology, Tarnished, here at Atomic Books! With Editors, Cara Bruce and Shawna Kenney, and readings by contributors: Tambre Leighn, Jennifer Tress, Valley Haggard, and more. 7pm - 9pm! Adult beverages will be served. My own twist on Feminist Ryan Gosling. The Cramps Redux, originally uploaded by sugarfreak. We're having our Jackets & Sleeves reception. tonight, 7pm! The art for The Cramps' Bad Music for Bad People is one of those classic pieces...and who wanted to take a crack at that cover? Stephen Blickenstaff, who actually did the original cover! This is his 2011 version. Tonight is also First Friday in Hampden, so come on out and walk around the neighborhood! There are a bunch of events and shops open late, with refreshments and sales. This month's Reading Club pick is Stranger Things Happen by Kelly Link! See you October 26th for the discussion - 7:30 at Atomic Books! New members are welcome at any time, and you get 15% off all the books for this year's Club titles. Join the Facebook Group for more discussion and updates. This Friday, October 7, from 7PM - 9PM we will be having a one night only art opening, called Jackets and Sleeves. What began as us wondering why it is that record are forever tied to a cover image while books over the years frequently get new covers turned into the idea for this art show. We compiled a list of some of our favorite, iconic records and books and asked a group of artists to create a new book jacket or record sleeve. The results, about 25 pieces in all, will be on display Friday night. It's also First Fridays in Hampden.